Stan Taniwa is a muralist and ceramicist based in Manitoba. Born in Chemainus, Taniwa’s family was forcibly removed from the coast when he was a baby and lived in an internment camp, eventually resettling in Thunder Bay. Taniwa studied architectural drafting and later ceramics at the University of Manitoba. He began exhibiting his clay works in the 1970s, with showings all across the prairies. In 1991, he was commissioned by the Japanese Canadian Redress Foundation to paint a mural in his original hometown of Chemainus. 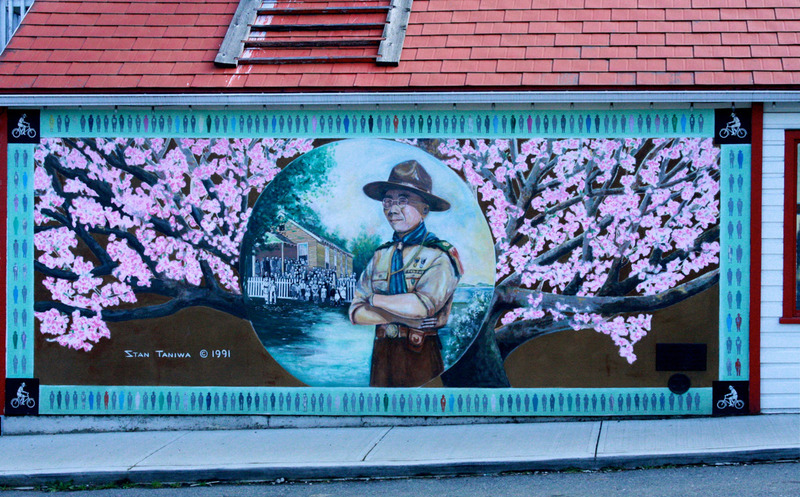 Taniwa’s mural, The Lone Scout, honours Edward Shige Yoshida, the Nisei who founded the first all-Japanese Canadian Boy Scout troop, the 2nd Chemainus Boy Scouts, in 1929. Since painting The Lone Scout, Taniwa has continued to teach and create work in paint and clay.